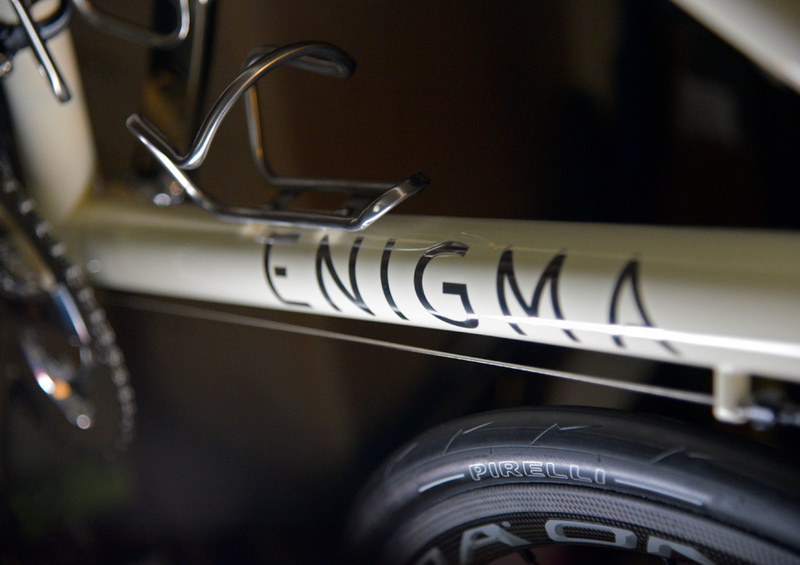 England’s Enigma Bicycles offered a nice canvas in their Echelon Ti frame. 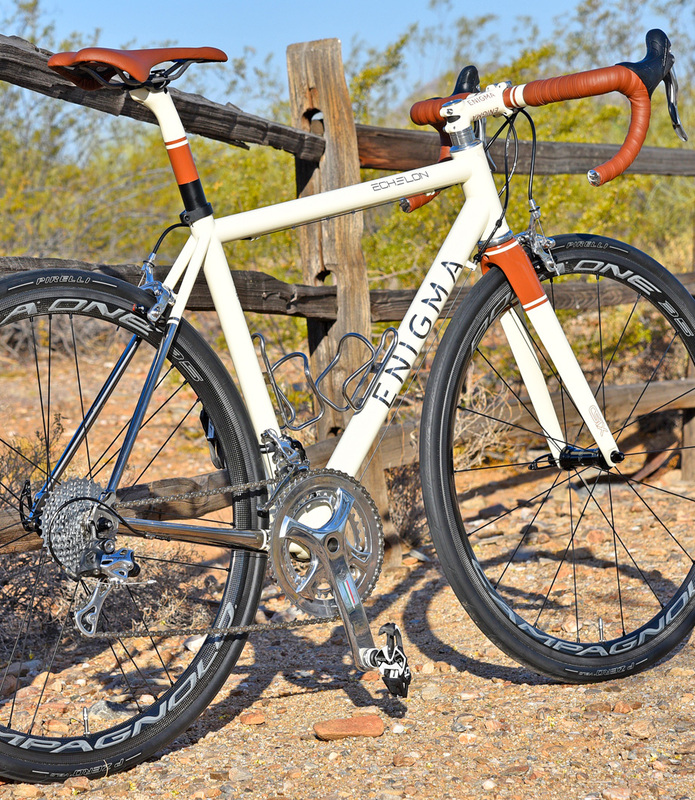 Technical Editor Charles Manantan took that up a few notches sending Cyclo-Retro a full Campagnolo group for refinishing and engraving and then selecting custom paint, saddle and tape for this one-of-a-kind build. The gruppo for this one traveled 34,000 kilometers from Vicenza Italy to Australia, to Ohio, to Connecticut, and finally to Arizona. The frame only had to go 10,000k, making the flight from Enigma’s East Sussex UK fabrication to Enigma NA’s Ohio HQ, then on to NAHBS, back to Ohio (on tour for a bit) then here to Arizona. 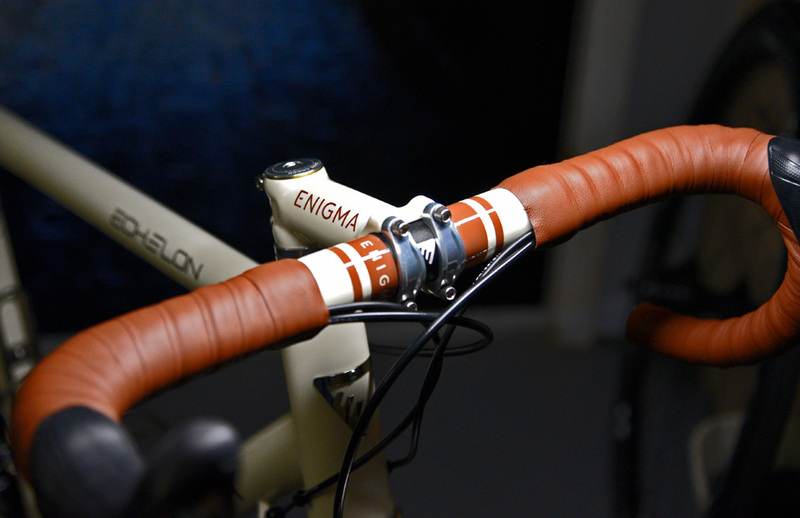 Even the Leather had to go from LEH Cycling in Austin Texas to Enigma in the UK so that the frame paint would match. 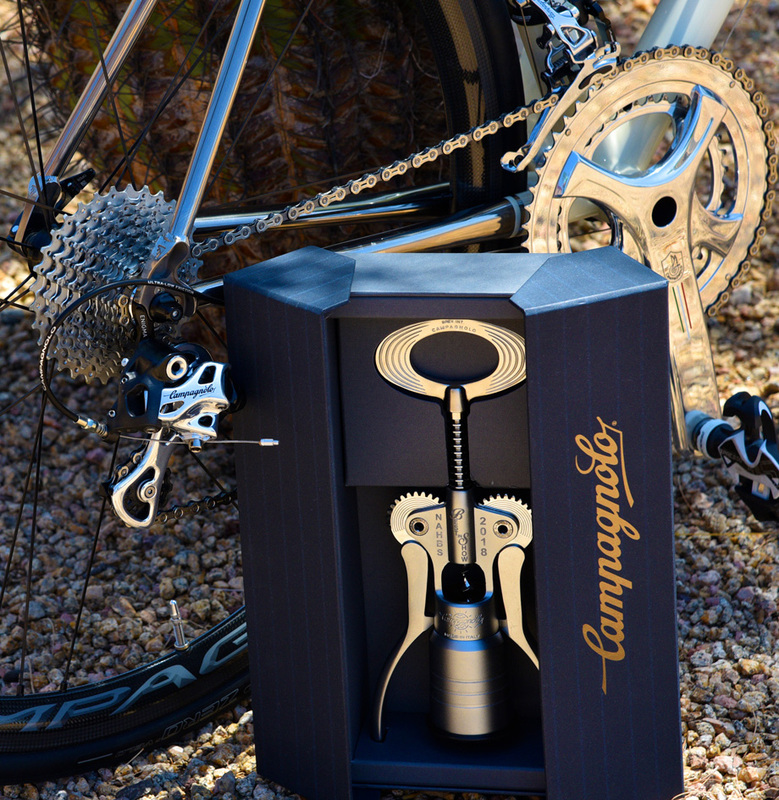 That’s a little bit of a whirlwind (and more than a couple dollars shed) but the results turned out fairly nice, winning Campagnolo's Best In Show Award at the 2018 North American Hand Made Bike Show. 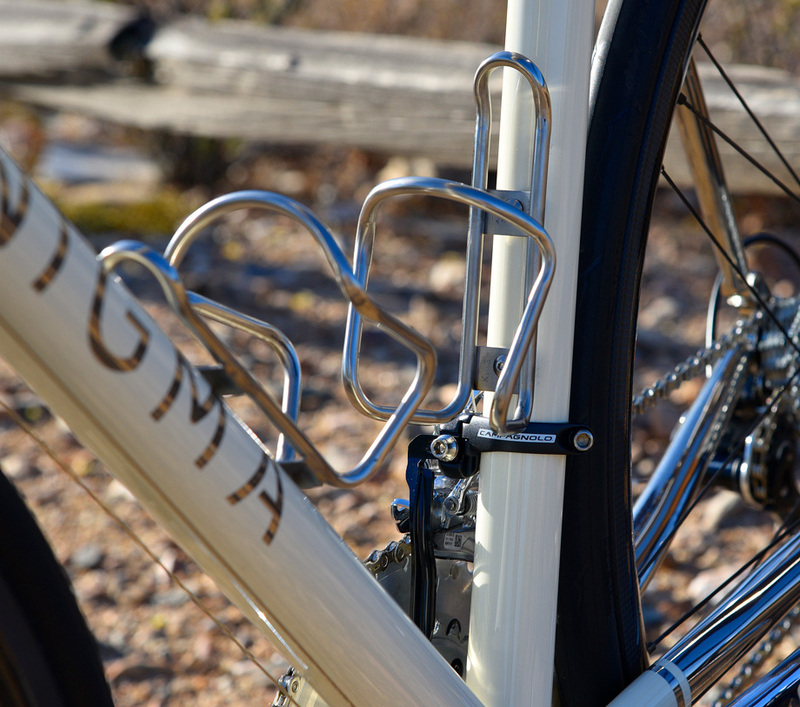 Enigma Bikes are the child of Jim Walker, who’s been in the bike biz in England for 4 decades. Just prior to Enigma, Jim operated UK distribution for some of cycling’s top brands and he sold that business and immediately set to work fulfilling a long time desire to build top quality frames. 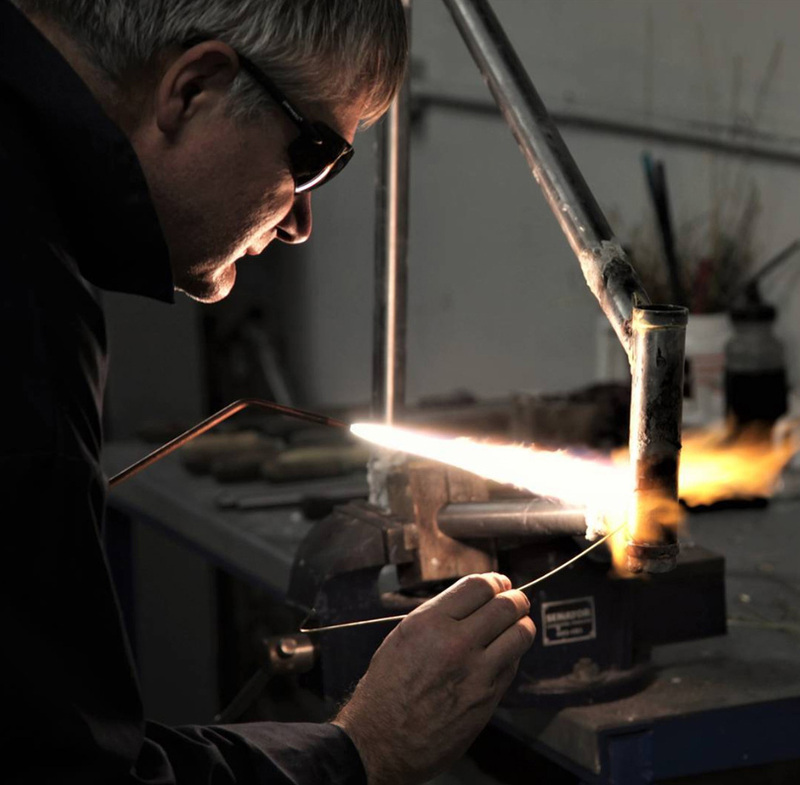 The team at Enigma are a close-knit group of actual family (his wife and sons are a part of the team) and a couple of tip-top craftsmen have joined to produce frames that are growing in popularity very rapidly around the globe. My first exposure to Enigma was through long time friend and Enigma North America boss Mike Musil and while Enigma’s paint work had tongue’s wagging on the trade show floor, it was actually the tight weld work on an unpainted frame that originally caught my eye. Not many frame builders (in any material) will disagree that it’s this step of fabrication, mitering, that really lays the foundation for everything else. 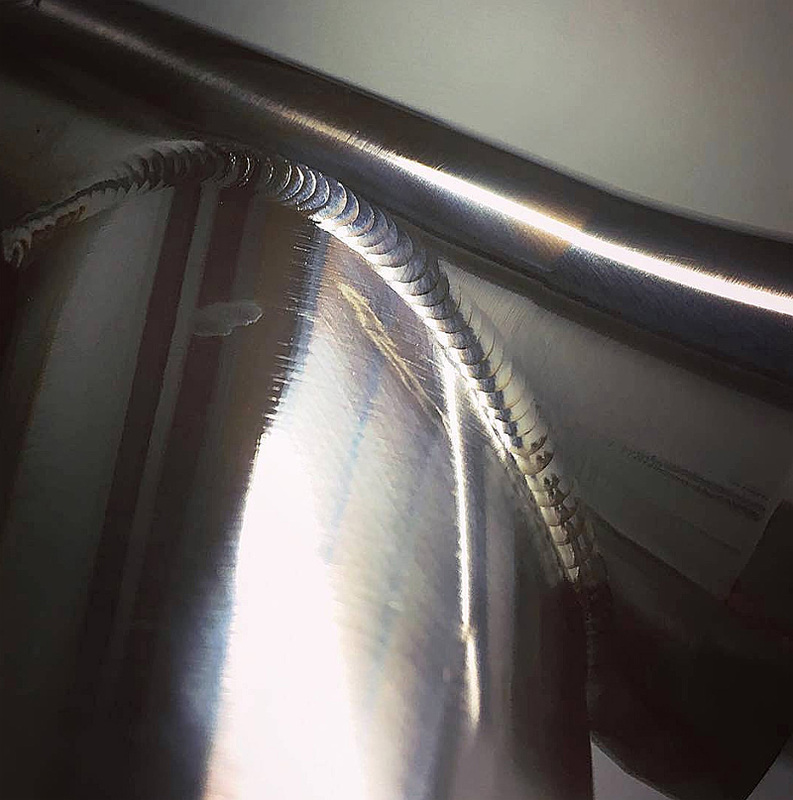 The welding will only ever be as tight as gaps between the tubes allow. Enigma also works in other types of tube joining. With this Project, another of enigma’s finishing capabilities gave me the idea on how to bring the full bike together with the parts choice. Enigma are VERY good at putting a full raw polish on titanium. 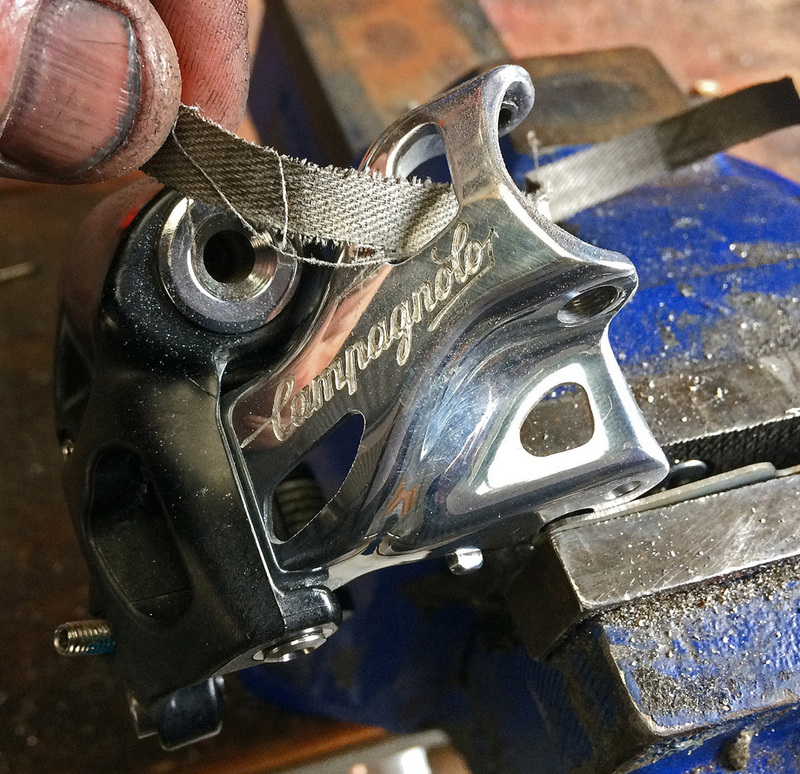 And it was that mirror finish that gave the inspiration to ship Campagnolo’s new Potenza Group off to Chris Howard at CYCLORETRO so that he might spin his magic. This is fully stripped and hand polished to mirror finish. The logos are all etched and then paint filled. The levers get machined cut-outs (near the top) and the same ground and painted logos in the metal. 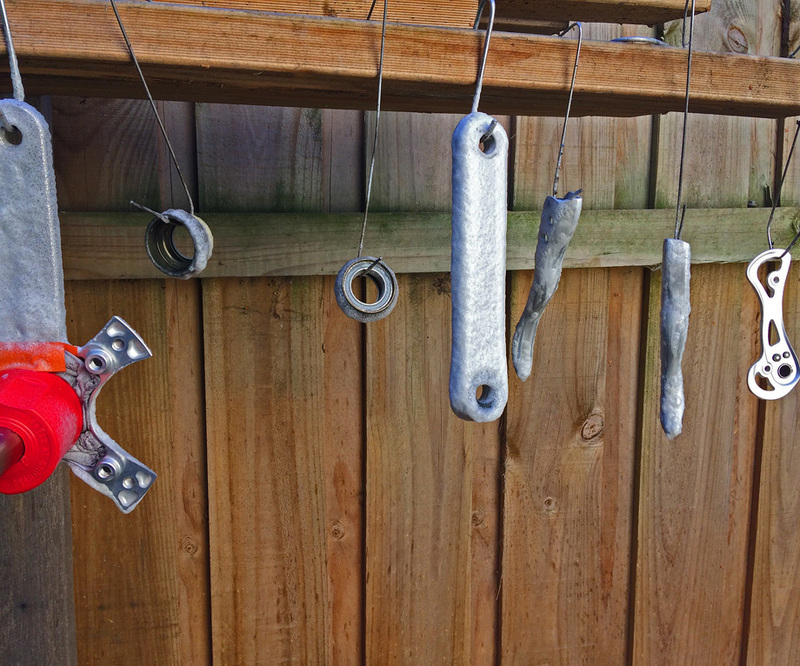 Getting different metal types to have a matched finish isn’t easy. Ti and aluminum don’t always play well together, but when they’re properly polished, the results speak well for themselves. Even the small bit of real estate on the front Mech gets the Retro treatment, though we left the clamp and chain keeper black to help them hide a little). The paint scheme wasn’t actually supposed to follow the traditional look. The first thought was a Bulldog face for a head badge and the tan spotted color of the traditional British Bulldog… But with the beauty of the high polish and the ability to have the old traditional logos applied, going back to basics seemed the right thing to do. The execution of the high polished Ti exposed logos is really well done. In fact, the detail of the paint is exceptional. The taping lines and edges of the color are so smooth and crisp that it seems more like the metal was always this color rather than being painted on. The brown matching the leather wasn’t by luck or chance. A bit of the hide was sent to the UK for an exact match before being stripped into bar tape. The same hide was used to custom wrap the saddle (handled by LEH in Austin Texas). The Frame itself has a fairly conservative tube set. Mostly Round in the triangle. They flatten out a bit side to side. 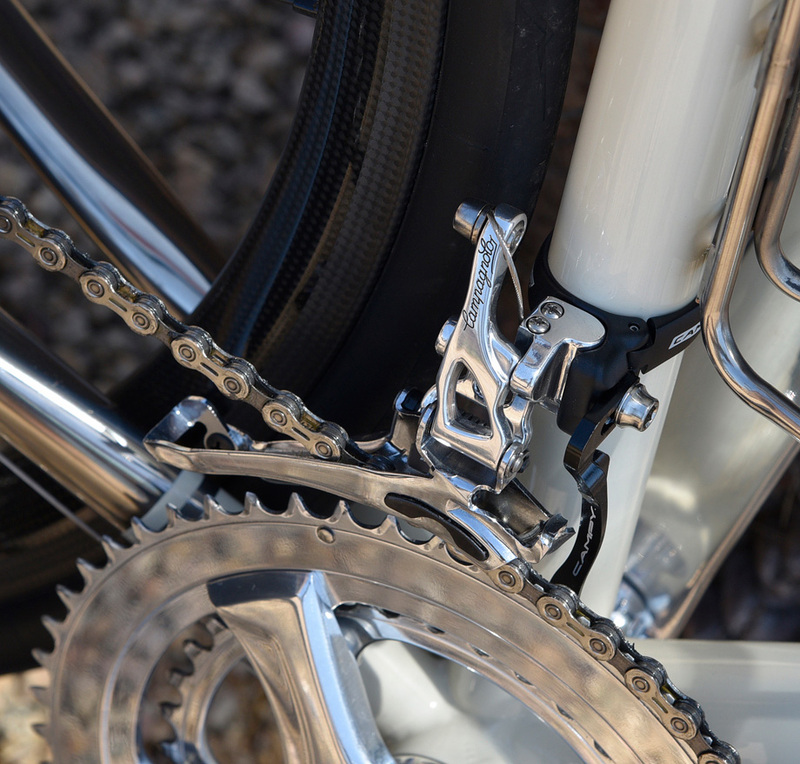 The chain stays start tall at the BB to help prevent twist/flex. And flatten out toward the rear wheel to help with lateral flex a bit. 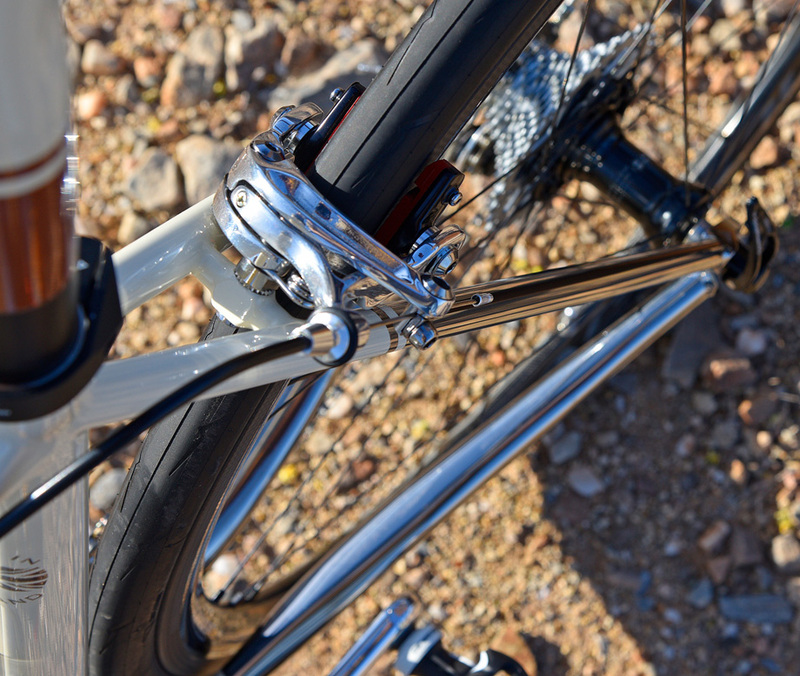 The stays all meet at generously sized drop outs (and a replaceable hanger). 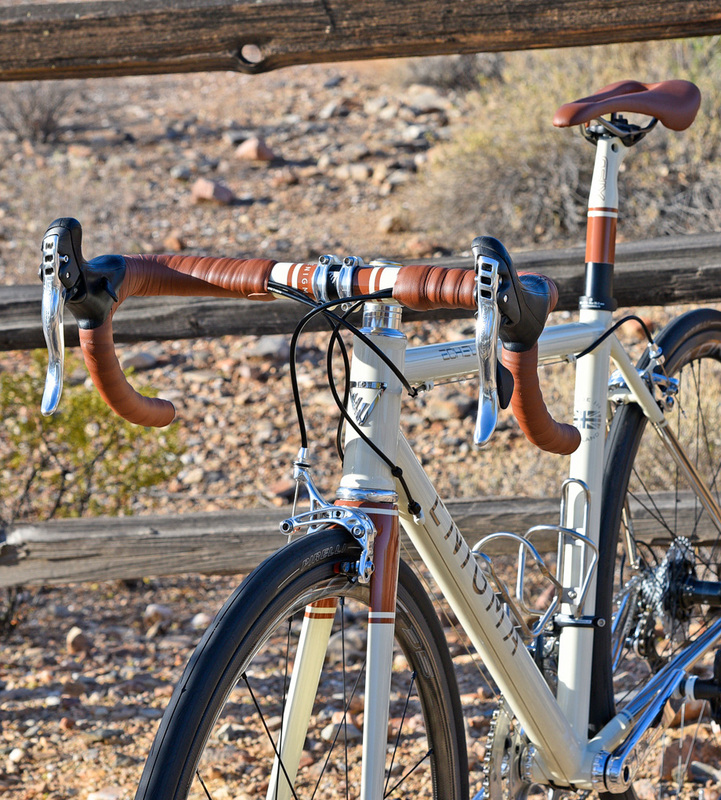 Honorable mention goes to King Cage for buffing up a pair of their bombproof Ti cages. 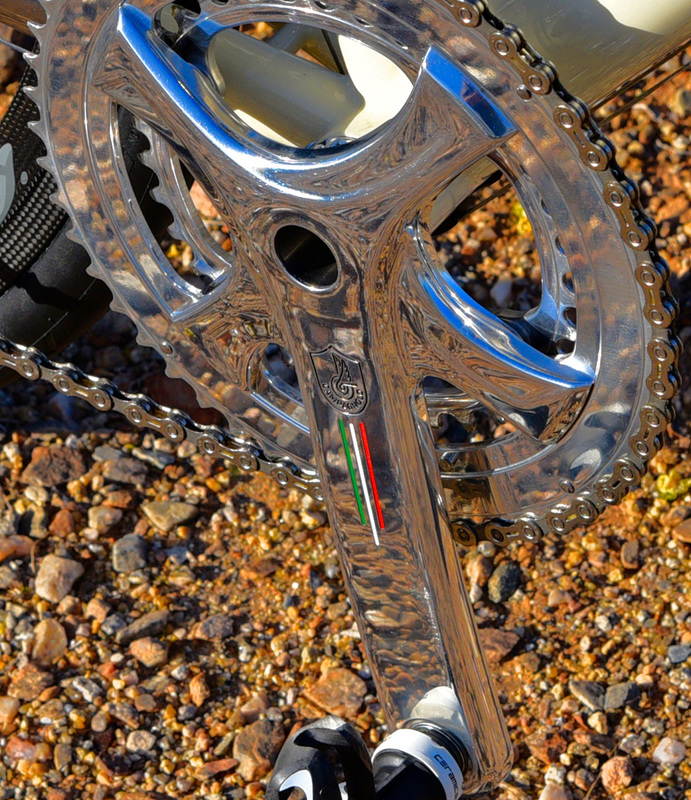 And Campagnolo’s very nice Bora One 35 wheelset. Wrapped in their compatriot's rubber, Pirelli’s P Zero are a great pairing with a conservative low profile. 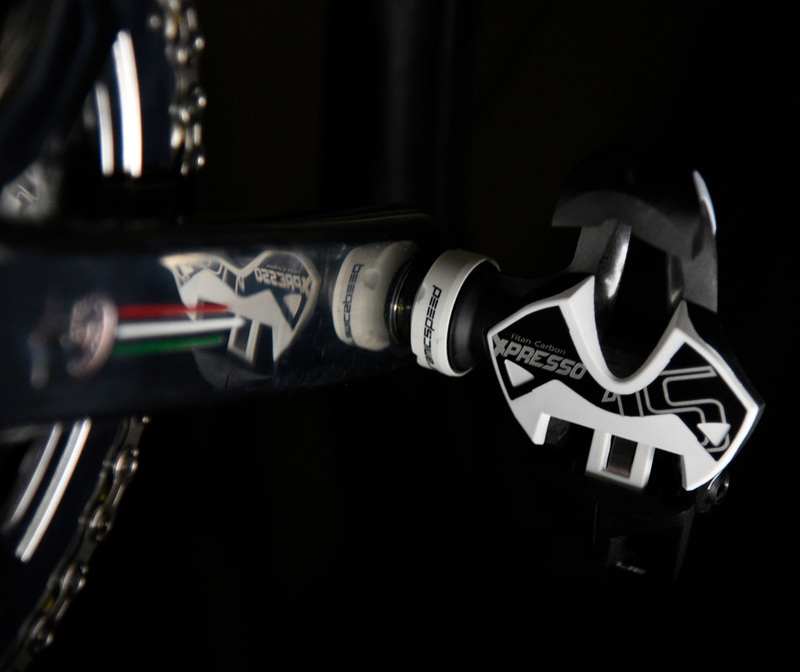 Time’s Super-flyweight Xpresso 15’s transfer all of the power. 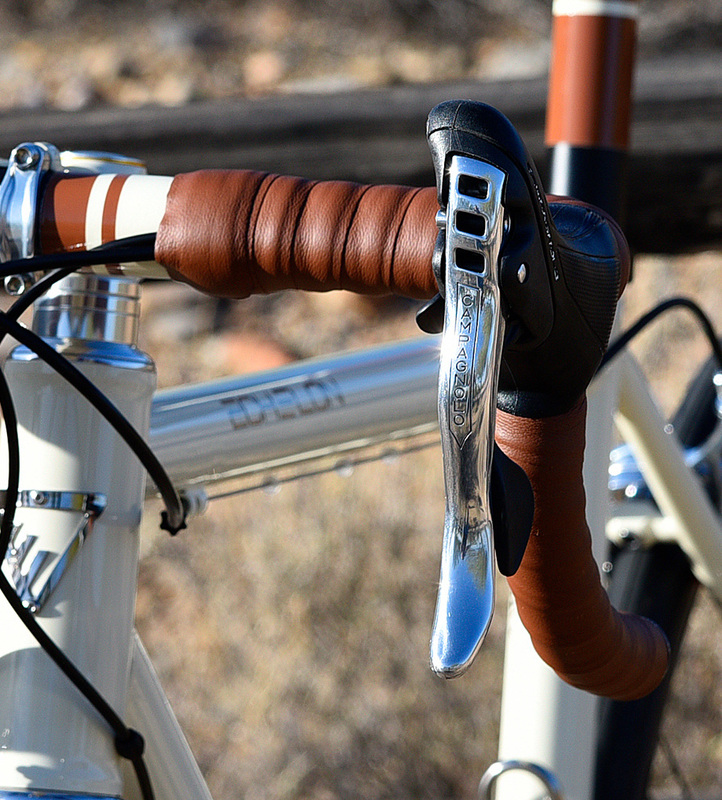 Given that replacing so much as a scraped up lever might mean 10 weeks, multiple shipments and another custom finishing, this bike might give you pause in risking it on the road. That would be a shame though as everything here is made for hard use. 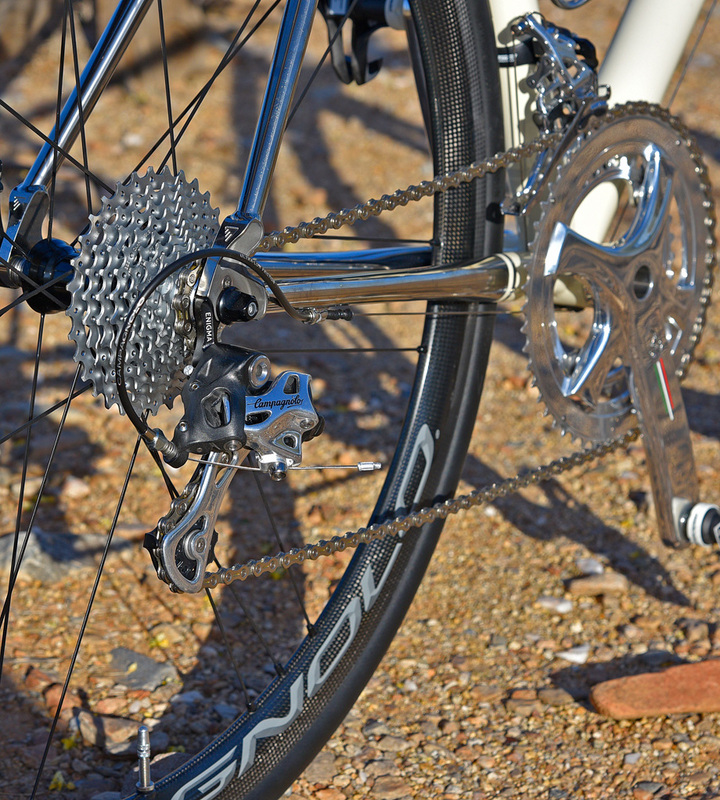 The drive train is rock solid Campy Potenza. 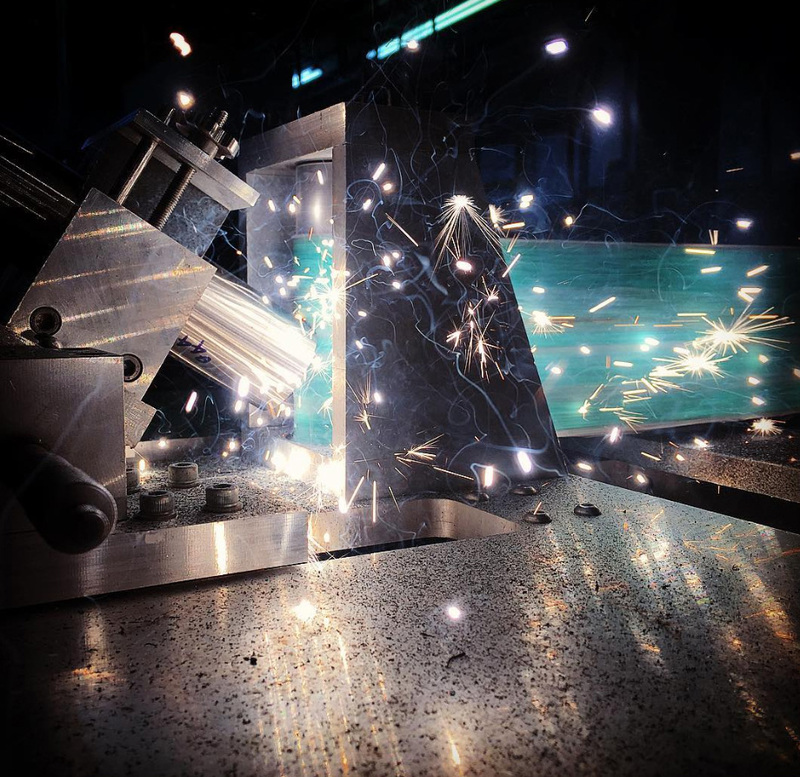 The polishing is straight to metal rather than some coating or plating. The saddle and bar leather are excellent quality. 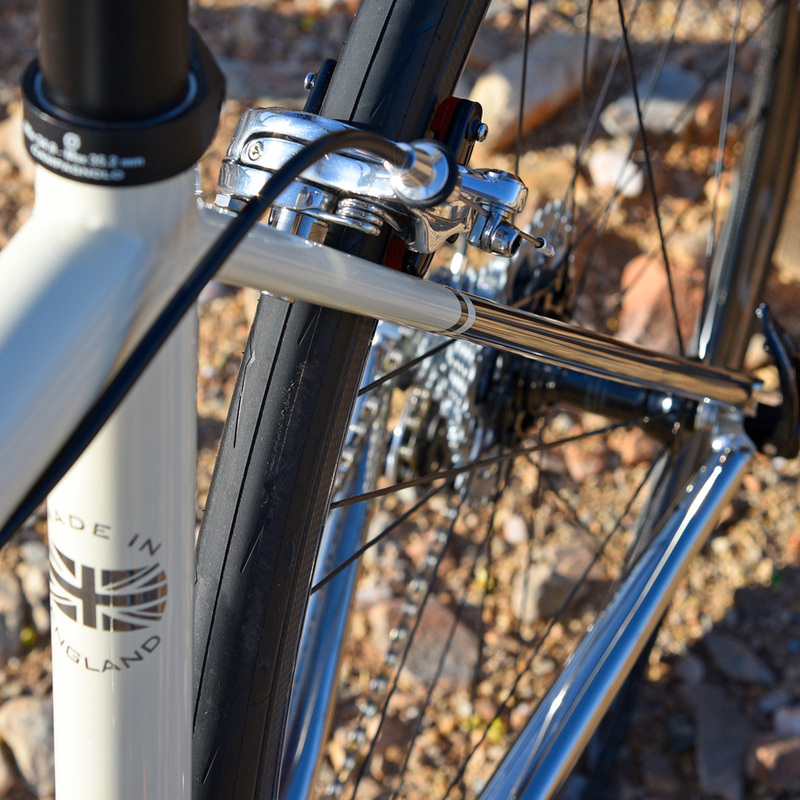 The frame is fabricated from top shelf titanium by caring hands to fanatical detail in the UK. 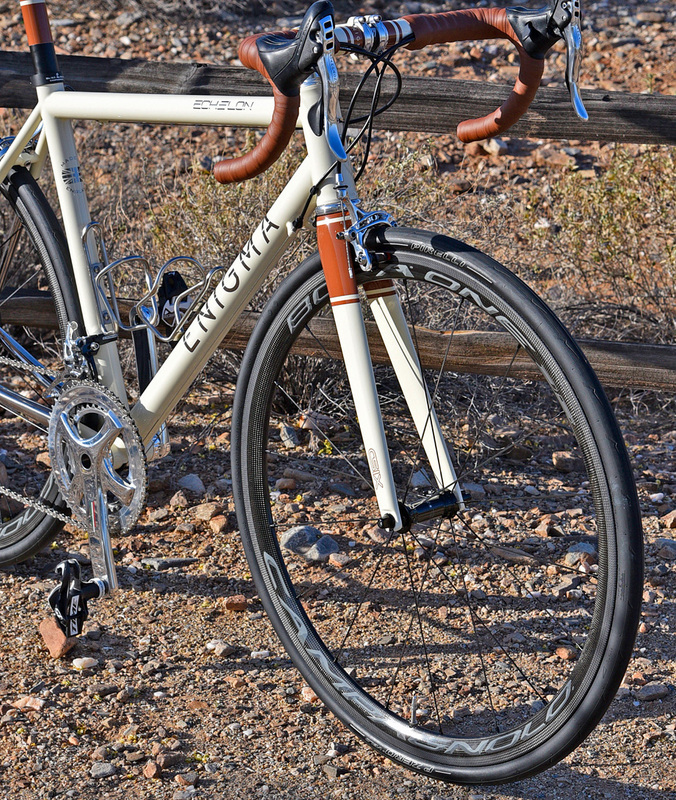 The wheels are race-ready Campy. And I’ll tell you without hesitation that Mike at Enigma North America is FANTASTIC at building things up. 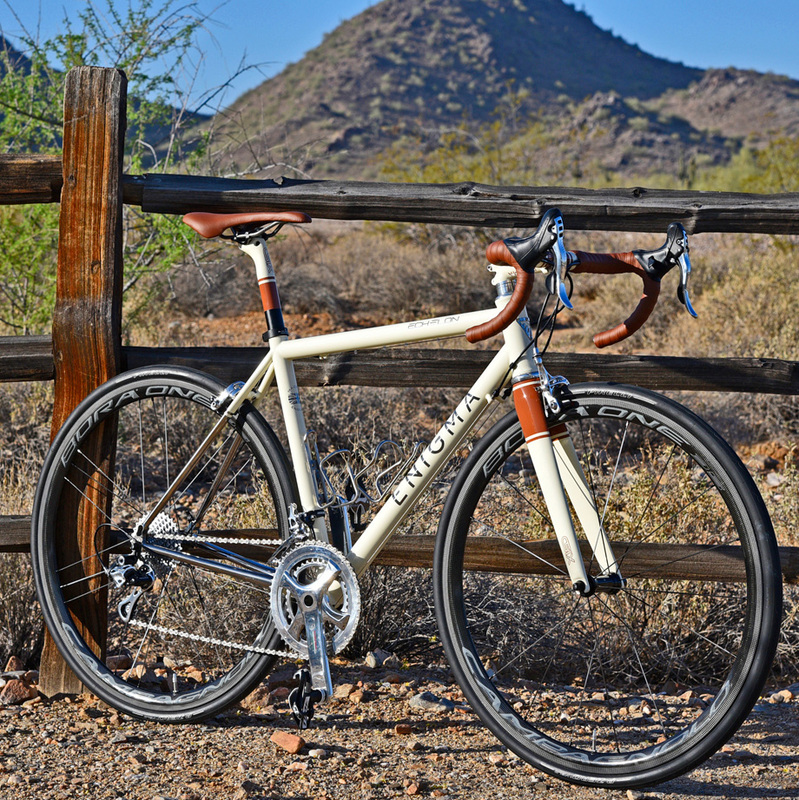 There’s a reason that Enigma have taken home multiple NAHBS awards for multiple years. 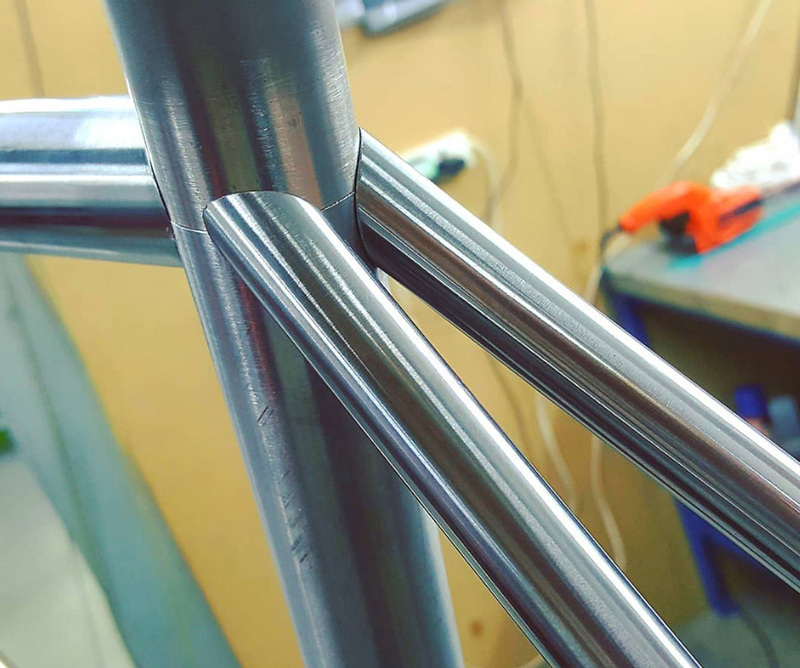 The geometry is custom here and the combination or this geometry with this tube set and fork make for neutral handling. Deliberate and responsive but not twitchy. Very ready to hold a line and adjust mid corner, but no surprises. Flex with this build is on par with something like Moots RSL. There is some give at the BB, but this is no place near the “sloppy bottom” which can happen as some metal builders these days try to hit a carbon weight spec only too find themselves with a bit of (or a heap of) a noodle. 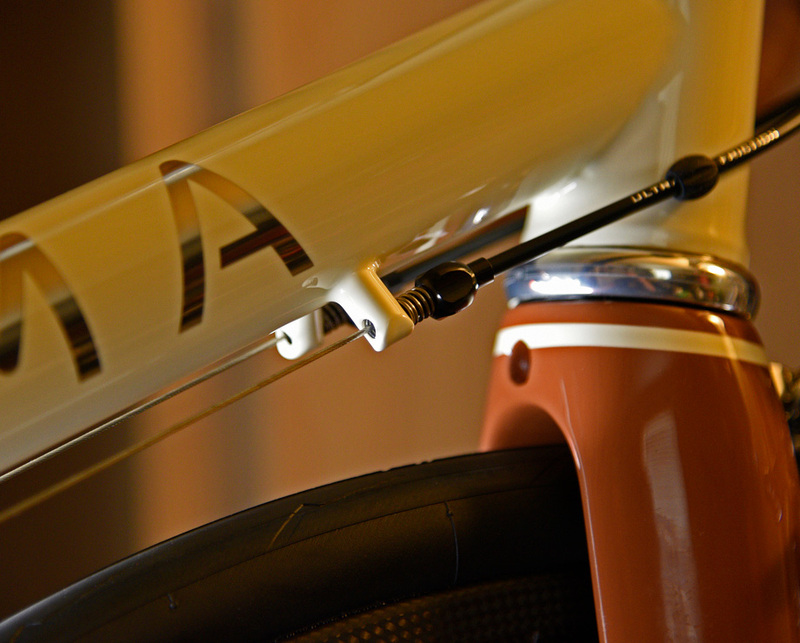 This is Ti done right, using double butted tubes that shed just a bit of weight without shedding performance. It’s likely that the 28 section Pirelli’s getting pumped to a lower pressure than you would run 23-25 section tires helps. Pirelli’s tires are relatively smooth riding in any case, but mate them to a solid set of wheels like Campy’s Boras and it’s certainly smooth. But the tires and wheels are not the whole story. I believe the quiet comes from very tight tolerances throughout and excellent design details. Every part fits tightly and smoothly onto this frame. 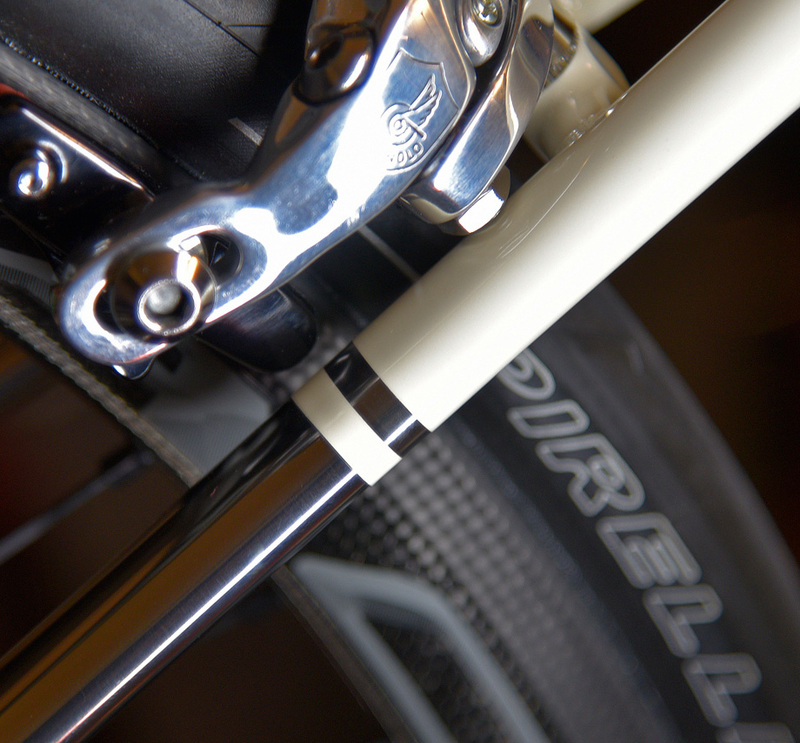 Even something as simple as the cable stand-offs and line adjusters fit well, move well but have no slop. 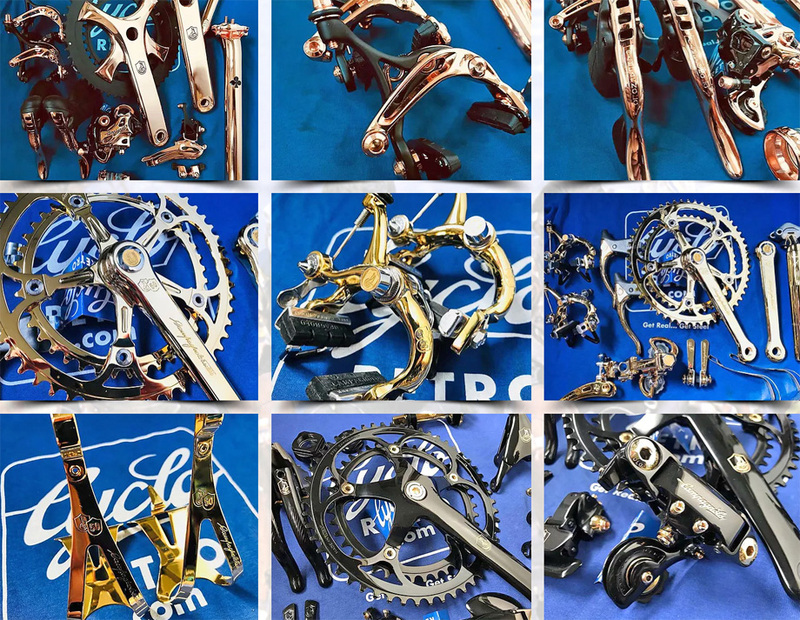 With all of this detail built into the frame and all of the parts working in a relationship more symbiotic than a lot of manufacturers' proprietary “integrated” pieces, there’s really nothing left to do but enjoy the ride. 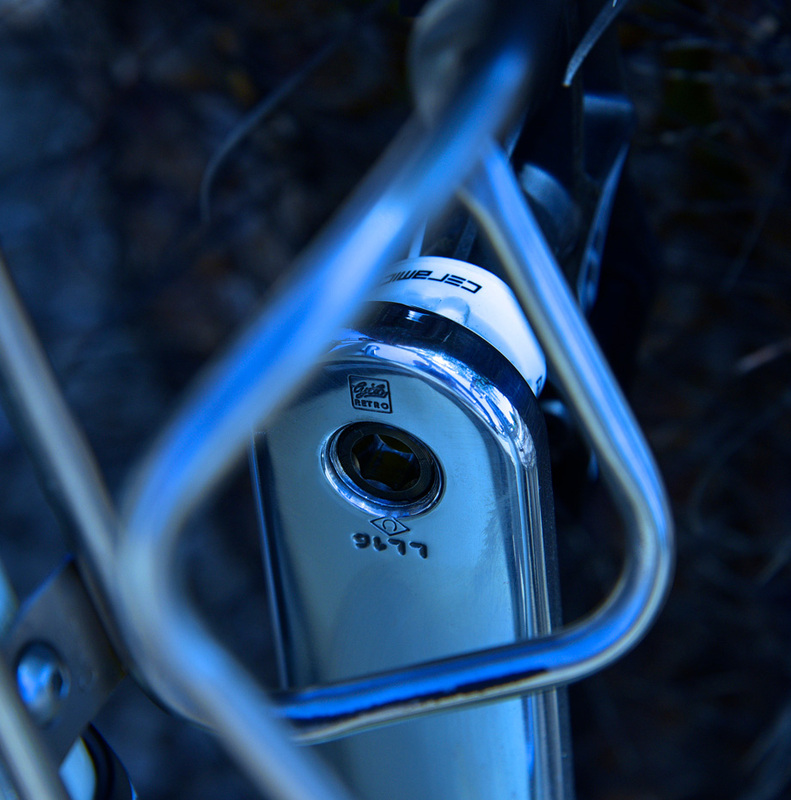 The Echelon tube set was put together to give “long ride comfort and performance”, in that order. I would agree fully with that hierarchy. Would I ask for anything else here? I initially thought that room for a larger tire would be nice, but then anyone looking for 32+ probably isn’t looking for road performance or a rim brake bike. I thought about wanting something more aggressive, but I would likely have jumped over to Enigma’s Excel in 6/4 Ti to grab a little more stiffness. 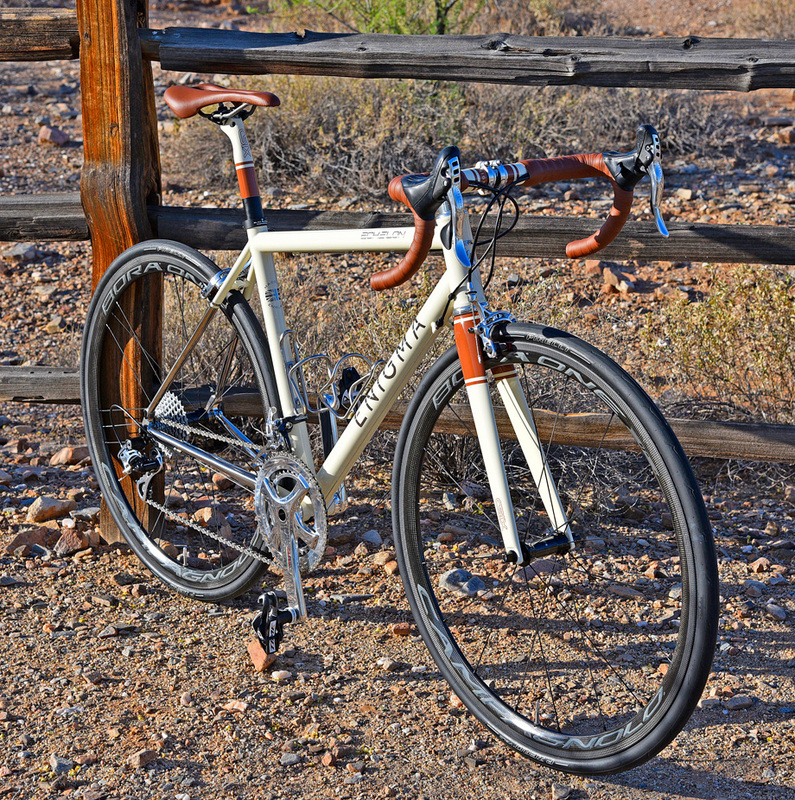 This isn’t a touring bike, it doesn’t rain here in Phoenix, so I don’t want or need mounts. No, nothing else comes to mind and if it did, Enigma would have added it during fabrication. The Echelon hits a sweet spot for me where comfort is on tap and in the case that I need/want to go very fast, this is completely at home. It’s also nice to have a bike that consistently grabs attention and comment from a fairly calloused/jaded regular ride group loaded with nice custom kit. This is one of those bikes that has even non-cyclists stopping and asking questions, knowing they’re seeing something special at a breakfast stop. Enigma have been making some VERY nice bikes and the accolades piling up are the logical result. Enigma North America started rolling in 2016 and at it’s first two North American Hand Made Bike Shows they’ve pulled down, '17 President's Choice (All Bikes), '18 Best finish (All Bikes), Best Campagnolo '18, and were Runner up in Best Road '17, Best commuter '17, and Best Road '18. The retail on this Echelon is, like most projects, a bit of a moving target when a company can do so many things… There’s a lot going on here and none of it by chance. Frame: Enigma Echelon 3/2.5 titanium frame. Handmade in England from custom butted and shaped tubing. 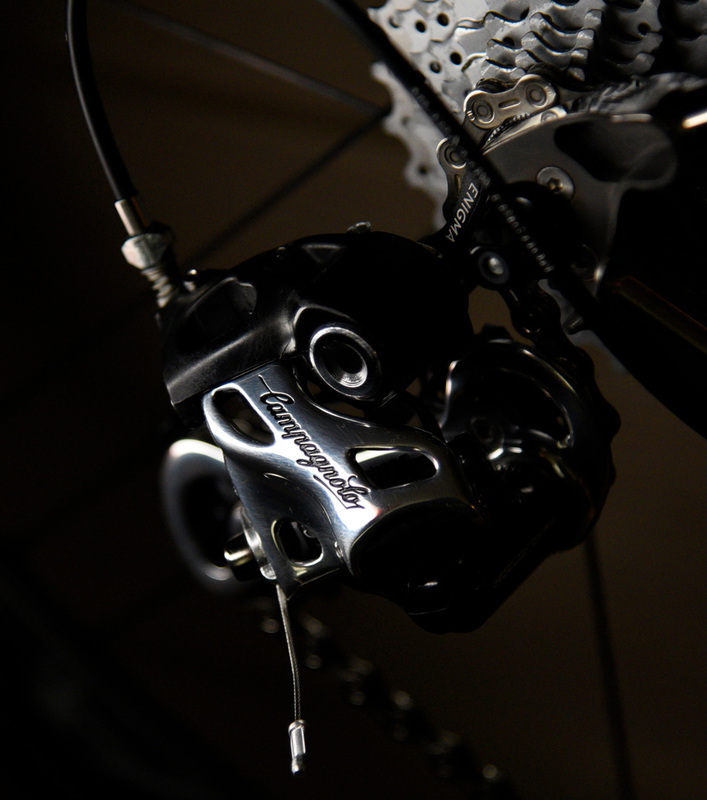 Exogen CNC'ed 6/4 titanium dropouts with replaceable rear derailleur hanger. Available in stock or custom geometry ($500 Included in the 3800). 44mm headtube. 68mm English threaded bottom bracket. Fits a 700 x 28c tire. 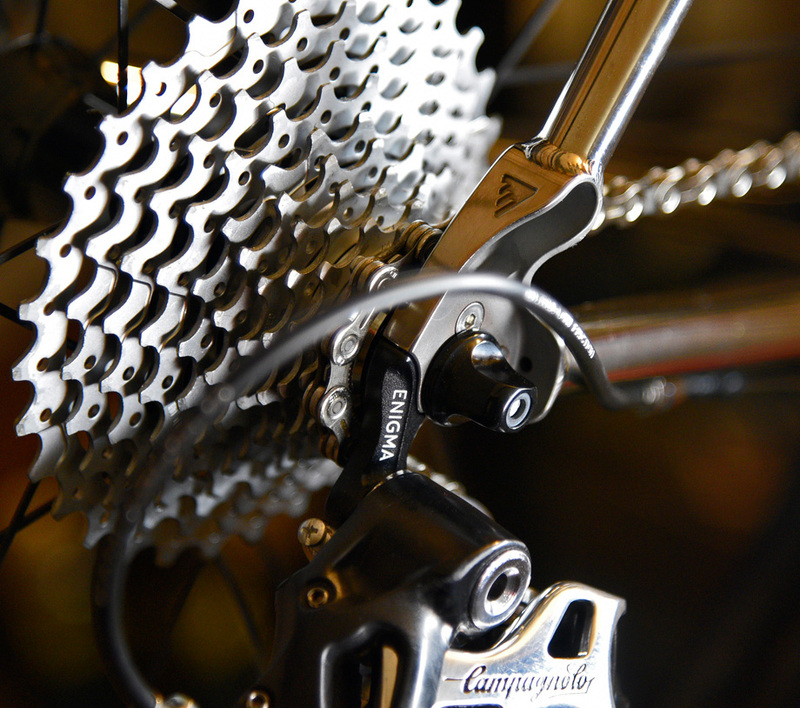 Available in mechanical or electronic build kits and external or internal rear brake housing routing. 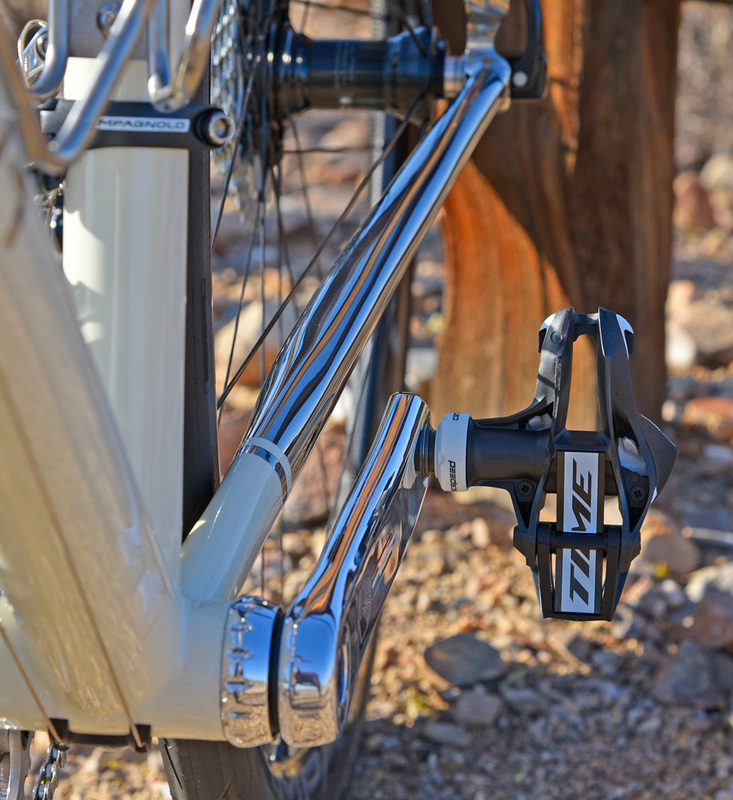 Braze-on front derailleur hanger or clamp-on style front derailleur mounting available. (Includes: Enigma sealed cartridge headset,40mm spacers, fork wedge and top cap, seat collar, cable adjusters and BB cable guide if mechanical). Fork: Enigma C-Six RD-SL Tapered carbon fork. 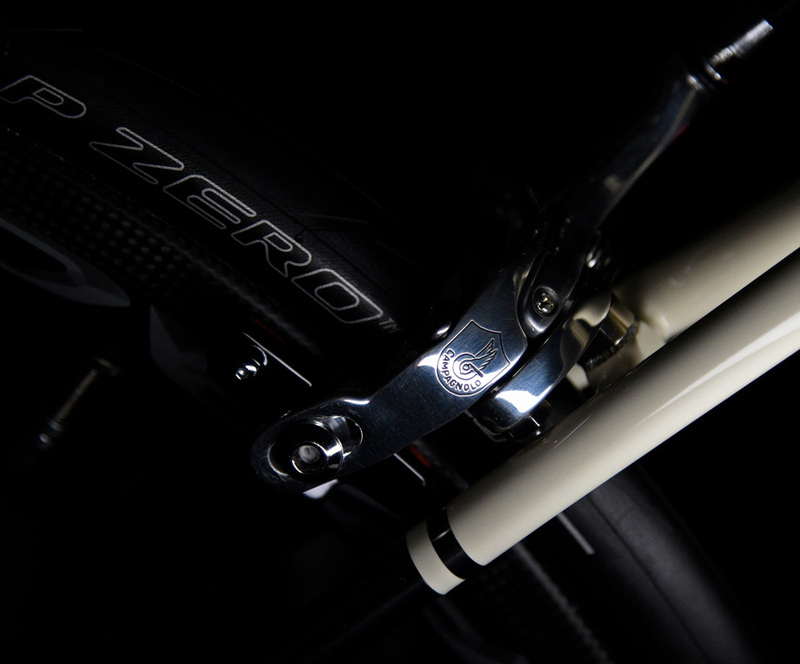 Based on the Enve 2.0 road fork with a slightly softer feel. Better for lighter riders or people looking for a smoother more comfortable ride. Full carbon with a tapered steerer. Fits a 700 x 28c tire. Saddle and Tape will vary based on hide choice and finishing… LEH are pretty reasonable and they can be MUCH more bespoke/custom than what I have here. Call them for price. 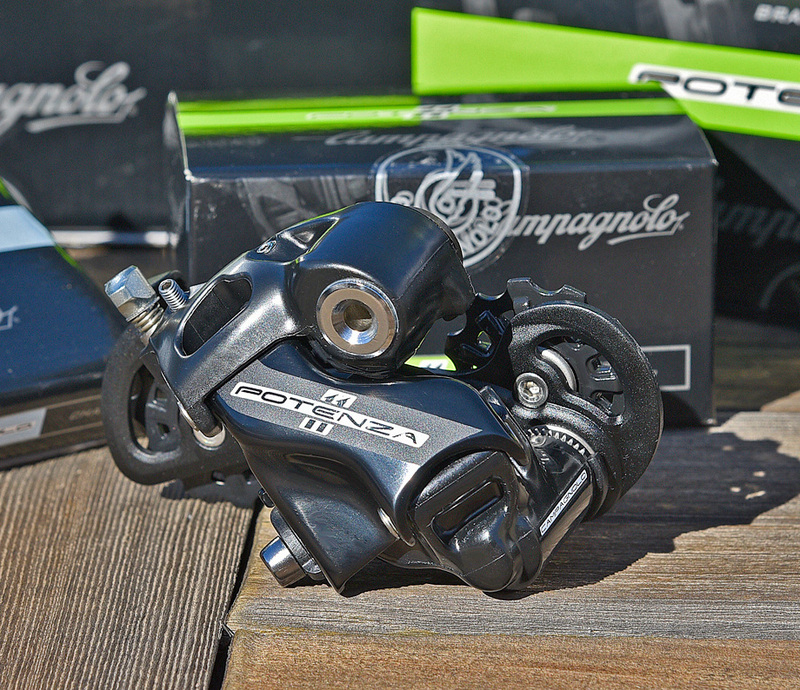 Enigma will get you the full Campagnolo Potenza Kit for $1125. Bora One 35’s are $2550 from Enigma. 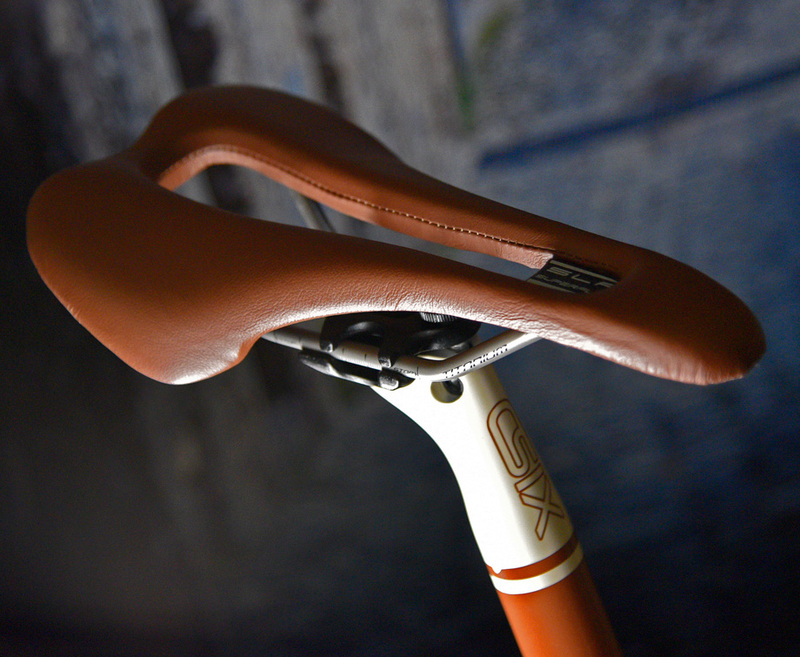 The Custom work (@600 Australian$) from Cyclo-Retro, not including shipping, will vary. You should go to his web site and have a look around, but I thought this would be more than the cost of the parts given the workload. Turning this (below) into what we have on the bike ain't easy. Just properly getting rid of the existing finish is several steps. So no, this wasn’t cheap as we didn’t include the King cages yet, Time pedals, Pirelli rubber, or the saddle cost. But when you can have something as custom as this for the price of a top line Trek/Specialized/Pinarello?? Value is relative and this level of craftsmanship for something completely custom fit and finished in a way that will be outstanding basically forever? A few thousand of you reading this have already spent more and received less.